A survey of 140 attendees at last week’s European Navigation Conference (ENC 2011) in London, England, produced a fascinating assessment of GNSS expectations in the coming years — and how that assessment has changed since 2007. Sponsored by Helios, a UK business and technology consultancy working in the transportation and technology domains, the survey asked delegates eight questions with multiple choice answers, and recorded their responses using handheld keypads and live electronic voting. 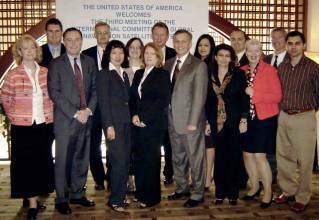 The past four years appear to have elevated the recognition of North America as a leader in GNSS innovation, rising 22 points to 56 percent in the opinion of 2011 ENC delegates. Meanwhile, those granting that role to China and Europe declined 14 and 6 percent, respectively. 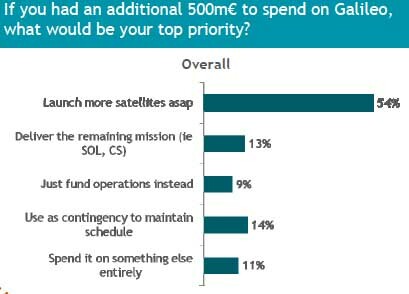 Despite the recent launches of Galileo’s IOV satellites and other good news about the European GNSS program, opinions about the prospects for Galileo have been pushed further into the future, according to the poll. Asked when they believed that the Galileo Open Service will be ready for operational use, 9 percent said 2015; 24 percent, 2016–17; 22 percent, 2018–19; and 40 percent, 2020 or later. 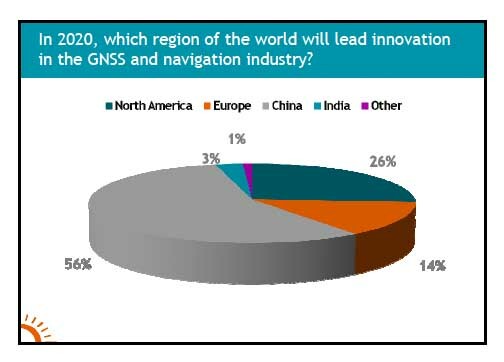 When the survey respondents were asked to imagine that it was 2020, 49 percent of them predicted that the order in which the GNSS systems reached the mass market would be GPS-GLONASS-Compass-Galileo. This option was even more strongly supported by self-identified GNSS users (62 percent) and industry/service providers (55 percent) than those in the government/public sector (50 percent) and consultancy/academic (43 percent) categories. Asked to name the solutions to GNSS vulnerability that delegates expected to be most widely adopted, MEMS/INS integration and signals of opportunity such as WiFi or cell ID were the top choices — 50 and 21 percent, respectively. Complete results of the survey of ENC 2011 delegates can be found online at the Helios website.